Brondby striker Morten 'Duncan' Rasmussen may be a transfer target for Celtic. Celtic are considering a move to add another goalscorer to their squad by bidding for Brondby goal ace Morten “Duncan” Rasmussen. STV Sport understands that the Danish striker, nicknamed Duncan after the former Rangers centre-forward, is the latest prospect to be brought to Tony Mowbray’s attention after club scouts scoured Scandinavia for talent. Rasmussen, 24, who is currently on international duty in Thailand, seemed unaware of Celtic's interest today, but appeared open to the idea of making a switch to Glasgow. "It is news to me, so I know nothing about it. It could of course be interesting, but it's not something I can relate to because it is only now that I have heard it," Rasmussen told TV 2 Sport. The powerful forward certainly has the credentials to add a cutting edge to Celtic’s attack. The 6ft 1in striker has scored 52 goals in 111 games for Brondby since signing in 2006. Rasmussen is entering the final year of his contract with the Danish club, meaning Brondby could be happy to cash in on their star striker if he makes it clear he wishes to move. Rasmussen is a rising star in Denmark and a move to a bigger club abroad seems inevitable. He is also chasing a place in the Denmark squad for the forthcoming World Cup and his national coach, Morten Olsen, says that Rasmussen must weigh up his options with the tournament in mind. The Danish season doesn't get underway against until March, leaving precious time for the striker to get into scoring form. "A player should always think about playing time," said Olsen upon hearing the news that Rasmussen could move to Scotland. "Morten must decide what is better: to move to a new club or to stay with Brondby. It is a big decision for him." Having begun his career at AGF Aarhus, Rasmussen got his big move to Brondby in 2006. The then Danish champions paid £1.2 million for his signature and were rewarded with consistent goalscoring form after the player overcame early injuries. 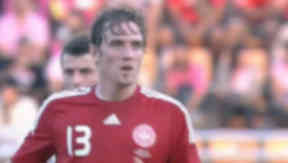 Rasmussen also has a fine pedigree at international level, having played for Denmark at all levels. The striker has a ratio of just under a goal every two games at youth levels and has made the breakthrough into the full international squad in the last year, earning three caps to date. The player is currently playing for the Danish League Select at the Kings Cup invitational tournament in Thailand. Rasmussen scored the second goal in a 3-1 win over Poland on January 17.